As I was dreaming about Chilled Avocado Soup last week, I was also dreaming up what to make to accompany it. I knew I wanted to go the Mexican route and that I wanted to keep the flavors really fresh and light to complement the soup. There is an enchilada recipe that I love in Fields of Greens that stars zucchini and corn, but enchiladas make me a little crazy. Frying corn tortillas in oil – even if it’s just to soften them – didn’t sound all that “light” to me. So, I decided to wing it and make giant quesadillas with the flavors I thought would play well with the soup. I grilled red onions, zucchini and whole cobs of corn. I cut the corn off the cob, chopped the other vegetables, and mixed them all together with plenty of cilantro and salt and pepper. I packaged up that mixture for my clients, gave them some cheese and tortillas, and a homemade tomatillo salsa – along with the soup and a Mexican rice. The beauty of Tuesday nights at our house is that we eat the menu I have created for my clients. I was particularly interested in tasting the quesadillas because I just kind of winged it, which is unlike me, and am happy to say they were delicious. A few notes about this recipe. The method for cooking the quesadillas may seem a little unusual, but I love it because I can make more than one at once with no problem. As written, the recipe will make three huge quesadillas – enough for six people, you can scale it down as need be. I wanted to use cotija cheese because I love it’s crumbly texture and salty bite. Sadly, Whole Foods – where I went because I knew they would have it – was out. I bought a cheese I had never seen before and now can’t remember what it was called. It started with an “A” and it was in the same section where the cotija should have been (along with queso fresco, etc) and it came pre-sliced. It was very mild and melt-y – kind of like mozzarella. For me, it wasn’t right for these quesadillas but Randy loved it. Use any kind of cheese you like here. Finally, if you made the Mexican Pizza and have any of the chipotle purée left over, it would be delicious thinly spread over the bottom tortilla. I’m not going to give a specific amount of cheese here because I think cheese tolerance is so different for each person. I love lots of vegetables and barely any cheese on my quesadillas. Some people like the opposite. I give you permission to use as much or as little as you like. If you have a large enough grill to do all the vegetables at once, by all means, do so. Cut the top off each onion, leave the root end intact, and peel the onion. Cut into 1/2 inch thick slices and place on a baking sheet. Drizzle with olive oil and season generously with salt and pepper. Place on the grill for 7-10 minutes per side – or until grill marks appear and the onion seems cooked through. Remove and set aside on a plate. Cut the ends off the zucchini and slice lengthwise into thick planks. Place on same baking sheet and drizzle with olive oil and season generously with salt and pepper. Grill for about 5 minutes per side – or until grill marks appear and the zucchini seems cooked through. Remove and set aside on same plate as onions. Husk the corn and place on same baking sheet. Place on same baking sheet and drizzle with olive oil and season generously with salt and pepper. Place on grill for a few minutes and then give the corn a quarter turn. Repeat until the corn is lightly browned in spots. Remove and set aside on baking sheet to cool. Once vegetables are cool enough to touch, cut the onions into 1 inch chunks, and the zucchini into 1/2 inch chunks. Place in a large bowl. Stand one end of a corn cob in the bowl and, using a sharp knife, slice the kernels off the cob. Repeat with other cobs. Mix in the cilantro. Taste for seasoning and adjust as necessary. Place 1 tortilla on a baking sheet (more if you can fit more.) Scatter 1/6th of the vegetable mixture over the tortilla, then add as much (or as little) cheese as you like. Top with another tortilla. Repeat with remaining tortillas, vegetable mixture, and cheese. Slide baking sheets into the oven and bake until the cheese melts and the tortillas firm up a bit, about 10 minutes. Remove from oven and allow to sit for 5 minutes so all the cheese doesn’t slide out. 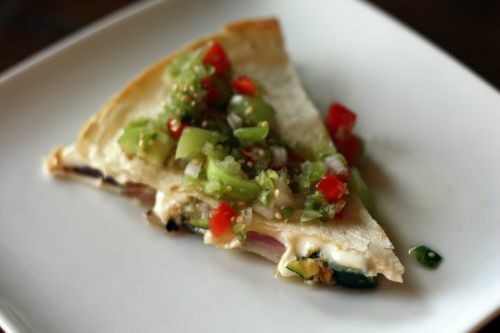 Slice into wedges and serve with tomatillo salsa. I often use store-bought tomatillo salsa and really like it. This is a totally different animal. It is very light and fresh tasting and also quite sour. It has none of the gumminess that store-bought can sometimes have. It doesn’t last more than a day in the refrigerator so feel free to use lots on your quesadillas! Coarsely chop three-quarters of the tomatillos and purée them with the jalapeños in blender or food processor to make the base of the salsa. Transfer to a bowl. Chop the remaining tomatillos and add to the purée along with the onion, bell pepper, lime juice, and 3/4 tsp. salt. Let the salsa sit for 1 hour to allow the flavors to blend. Add cilantro just before serving. Oh, This looks absolutely delicious! We must be foodie sisters. Dana and ..Dana who love food! This post made me hungry! Nice combo, and how can you go wrong with avos? Thanks for the post! I love tomatillo salsa but never made it since it’s hard to find tomatillos around here. Nice meal! Ooo yum! I want to make that avocado soup tomorrow and wasn’t sure what we’d eat with it so maybe I’ll make up some simple quesadillas. I think I like my quesadillas with a lot of vegetables and a lot of cheese! Looks delicious. Dana, this quesadillas of yours look so tempting and delicious. 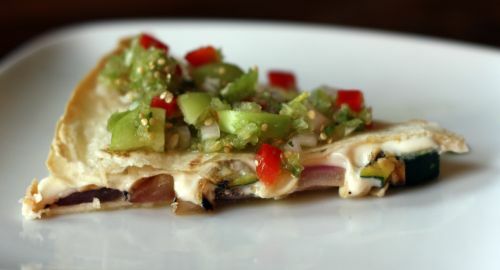 Quesadillas are one of my favourite vegetarian meals! I also use very little cheese in mine (I’m not much of a cheese person) but I especially love a bit of smoked cheddar.